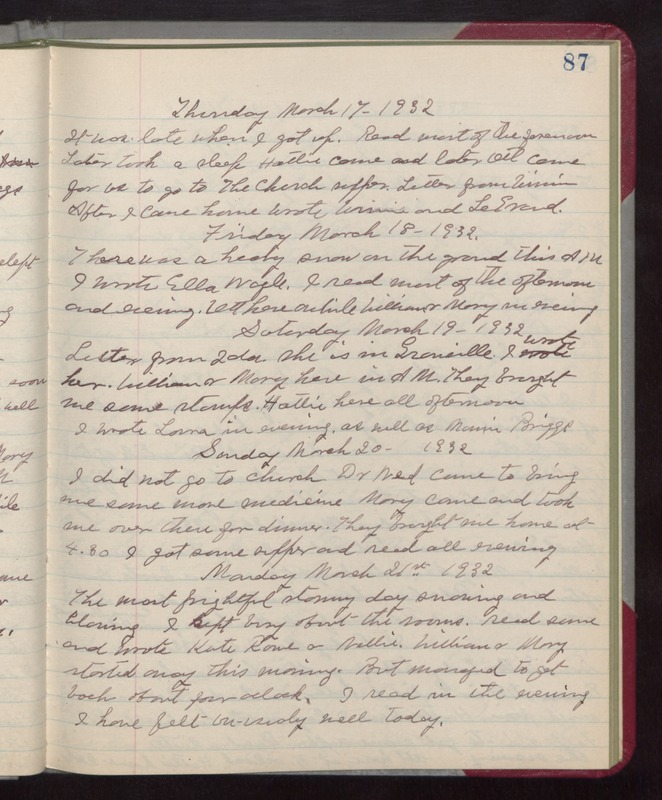 Thursday March 17- 1932 It was late when I got up. Read most of the forenoon Later took a sleep Hattie came and later Ott came for us to go to The Church supper. Letter from Winnie After I came home wrote Winnie and LeGrand. Friday March 18- 1932 There was a heavy snow on the ground this AM I wrote Ella Nagle. I read most of the afternoon and evening. Ott here awhile William & Mary in evening Saturday March 19- 1932 Letter from Ida. She is in Granville. I wrote her. William & Mary here in AM. They brought me some stamps. Hattie here all afternoon I wrote Laura in evening, as well as Marnie Briggs Sunday March 20- 1932 I did not go to church. Dr Ned came to bring me some more medicine Mary came and took me over there for dinner. They brought me home at 4.30 I got some supper and read all evening Monday March 21st 1932 The most frightful stormy day snowing and blowing. I kept busy about the rooms. read some and wrote Kate Rowe & Nellie. William & Mary started away this morning. But managed to get back about four oclock. I read in the evening I have felt un-usualy well today.